Windows Live Messenger 8.1 (previously known as MSN Messenger) has been officially released from beta phase to final version. WLM 8.1 is the latest instant messaging (IM) client from Microsoft that is optimized for Windows Vista, and is the second major release after the IM client officially changing its name from MSN Messenger (last stable version been 7.5) to Windows Live Messenger with initial final release at version 8.0, and ahead of Yahoo! Messenger for Windows Vista which only has preview available. Contact Card – The contact card has gotten a updated look. Instead of a flip it does a slide to toggle between the Spaces and Contact information. Also no more squinting at an icon and trying to figure out what it means the actions on the card are now listed out plain and simple. Emoticons, Winks, Backgrounds, Display Pictures – The menus have gotten an updated look. They include a recently used list and easy access to featured content so you can get new emoticons, winks, background and display pictures to use. hint: typically in the featured section the first 4 are free. SMS Phone Book – You now have a quick way to send SMS to a phone number or add phone numbers for your contacts. Just click the cell phone icon in them main window for a good time. New Contact Emotion – In 8.0 all our icons got an update but we forgot a very important one. The contact emoticon. Type (M) to send it. Status Menu includes Sign Out – We noticed people look in the status menu to sign out and so ta-da now you can sign out from the status menu. Report abuse – Here is something you will hopefully never need to use, but it is there just in case in the help menus. Vista Presentation Mode – When you are in Presentation Mode on Vista Messenger will change your status to busy so you can avoid the embarrassing situation of everyone reading your IMs! Don’t worry if you want to show Messenger in your presentation you can turn this off (Tools->Options-> Personal-> My Status -> Show me as “Busy”…). Behind the scenes changes – This release also includes changes to the “guts” of some of the features. The goal is for these changes to improve your experience. Please let us know if that is not the case. Personal Invitation – When you add a new contact you can add a message so they know who you are. Especially helpful if your email address is something like ILoveMessenger(at)emaildomain.com – since there are so many of us out there. WLM client now available in Messenger is available in 8 new languages, namely Bulgarian, Estonian, Croatian, Latvian, Romanian, Serbian Latin, Thai and Ukrainian. Better handling of incompatibility of older version of Flash with WLM 8.1 in Windows Vista. E-mail invitation when adding a new contact. 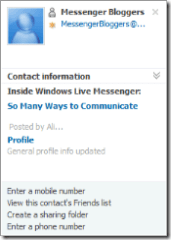 Download Windows Live Messenger 8.1 (or latest version) from here. If you’re running WLM 8.1 beta, you will be prompted to upgrade your WLM client automatically. Update: Windows Live Messenger 8.5 is released, however Windows Live Messenger 8.1 still useful for Windows Server 2003 and Windows XP x64 edition that does not officially support 8.5 and beyond.